I regret the delay in my posting something personal or reflective since I have been home from Haiti, but I truly didn’t expect to have such a sudden depletion of energy. The first day I was so thankful to return to my bed, my partner, the warm shower, clean streets, water I can drink confidently, the freedom to prepare and eat my favorite healthy meals, the technology to re-visit friends and business and all the other blessings of the life I was given. Monday morning, I woke full of energy and crashed about the time I re-visited work. I hadn’t spoken to anyone but Scott before that and hadn’t left the comfort of my home (which seems so extravagant to me now, though very modest for American standards.) Going to work yesterday, I felt like I could cry or fall over from the fatigue of carrying the heaviness of my spirit. I had less patience with the kids at afterschool, less comfort with the abundance and was deeply disturbed by the inequalities of the world. Having been to Haiti before and seen other impoverished communities, I thought I would return ready to re-engage even more thankful of what I have than before. By Tuesday in Haiti, I was so grateful for having work at all, especially work that is often fun. (I heard the figure that only 20% of Haitians are employed.) But the ‘culture shock’ hit me and I wasn’t able to focus on the gratitude I had meditated on so frequently in Haiti. I am struggling to remain centered while processing the range of emotions that are deeply affecting me. Surprisingly, a week there allowed time for creating new and re-newing old relationships in this mountain community in Fondwa. 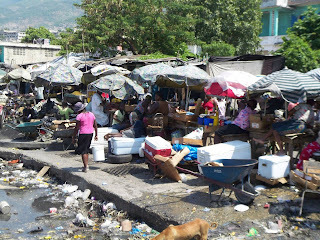 Haitians are generally relational, friendly and talkative. The hoops also worked their magic in allowing me to communicate with folks of all ages and languages during my trip. Though sad at moments, I am trying to lovingly remember the folks I connected with- the smiles, songs, silence, dances and conversations shared - and feel gratitude and joy. As for my original goal, I feel pleased and successful. We brightened up the orphanage with a new coat of paint the first day. The next day I returned with 20 hoops which proved to be a delight for all ages (orphanage housed 48 kids aged 3 – 20). My next visit, I carried another arm-load for kids to decorate. When I arrived, they were already hooping, spinning and playing. Full of smiles, they sent love and thanks to our community. I sincerely appreciate everyone believing in this mission, the personal efforts to assist my traveling to Haiti with as many hoops as their space could handle and helping me to raise needed money for feeding the orphanage. I hope to re-visit that community again and again to deepen my relationships with individuals there and understand more about this complex and interesting culture. By Wednesday of last week, I was set on returning home to convince Scott to move there with me for a year or two. Oh the flight of a feathered heart. Now, I feel conflicted about the right way to make a difference and live my life. I fell in love with the kids, the landscape, the mountain walks and being in tune with the natural rhythms there. I truly want to offer more to the orphanage and the community, but there are various ways to do so. I am so grateful to have had the opportunity to meet and learn from a tribe that IS the maidan – a group of mostly female orphans who take care of one another. They are all mothers and sisters to one another. Witnessing how much some of them truly want a Mother - to perhaps fulfill an idea of a special guardian who will take care of them and give them hope of something greater – makes me sad. I hope they will be able to comfort and assist one another in the coming years as a strong tribal community. As I hope we will. I am so grateful to have such a wonderful community here to return to. As you can imagine, I will continue to post bits and pieces, reflections, pictures and hopefully even video clips from the trip. I learned so much, met wonderful people and had many beautiful experiences that I would love to share. There was a father, an Episcopal priest born and raised in Brooklyn, who was living indefinitely there in Fondwa. I would guess he’s near 80, but still a vibrant and magical soul who dedicated nearly 40 years in a church in Louisiana fighting for civil rights. He is spending a lot of his time now in silence- reading & walking. It’s not a vow he’s taken, but a practice. I enjoyed spending time with him in conversation and in silence during my time in Fondwa. He has been very present in my thoughts as I have struggled to understand the emotions and ideas that run through me and weigh my heart. His theology was based in Christianity, but focused more in the lost mystical practices of the Christian tradition that seem nearly Buddhist in spirit. I’ve tried to remember him in these days by practicing some silence so that I may hear the voice of a great spirit if she chooses to speak to or through me or guide me in the coming time.